When photographer David Leventi saw Andreas Gursky’s famous shot of Stateville Prison, Illinois, he was captivated by the architectural form and wondered if there were more roundhouse prisons. As we know, and as Leventi says, “everybody has photographed at Stateville.” However, not everybody had photographed the roundhouse prisons of the Netherlands. Leventi has. I spoke with David via Skype. He provided me with some prepared answers to questions asked by photographer Sarina Finkelstein. I have interwoven answers to my questions. The quotes are verbatim, but the order is not. The flow works. Sarina Finkelstein (SF): What was the first round prison you photographed? David Leventi (DL): The F-House at Stateville Correctional Center in Illinois is one of the most architecturally striking prisons — it is the last remaining cell block in the U.S. that follows Bentham’s Panopticon model. It was close to home with no language barrier to contend with, and therefore it became my first. SF: How many round prisons exist in the world? Have you photographed all of them? DL: Four working prisons and one ruin. I have photographed all the working ones: Stateville Correctional Center in Illinois, Breda Prison in The Netherlands, Arnhem Prison in The Netherlands and Haarlem Prison in The Netherlands. The ruin is the Presidio Modelo on the Isla de la Junvetud in Cuba. Fidel Castro was imprisoned there, and I hope to photograph it one day. 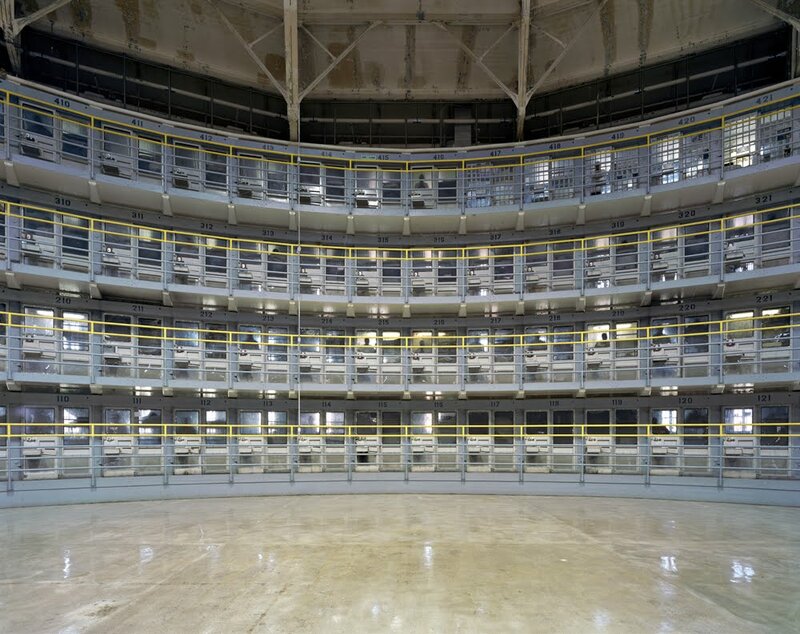 Prison Photography (PP): Now you’ve been to other roundhouse prisons, what do you make of Gursky’s photograph? DL: All of Gursky’s photos make spaces look bigger. I think Gursky did a lot of post production, I think he extended the space, drawing the image out to the left and right making it look enormous, but its not. In my photos, Stateville looks big because I’m shooting large format with a wide angled lens, but it’s not THAT big. It’s an illusion. SF: This project photographing round prisons seems to be a drastic content shift from your previous work photographing world-famous opera houses? DL: The prison project developed out of my previous project shooting opera houses. Each was photographed from center-stage and lit solely by the existing chandeliers and lamps. The opera houses were spaces in which my Romanian grandfather, Anton Gutman, never got the chance to perform. He was a cantor who was interned in a Soviet prisoner-of-war camp called Krasnogorsk from 1942-1948. Another prisoner, Danish operatic tenor Helge Rosvaenge, heard my grandfather sing an aria from Tosca and gave him lessons. I grew up listening to him sing in our living room. SF: So, in your previous project, you photographed cultural institutions that are social gathering spaces of entertainment. But, in this work, you’re photographing prisons — places where people are incarcerated and deprived of personal freedoms for commission of a crime. And, you’re specifically photographing domed prisons. How did you come to choose these particular buildings? DL: Domed prisons are the closest examples of Jeremy Bentham’s Panopticon model of mass surveillance prison design – a central guard tower with a complete view of surrounding prison cells. This concept was designed so a central observer could monitor all of the prisoners at once, without any particular prisoner being able to feel under inspection. The domed prisons have the same architectural structure as an opera house (without the opulence), but the difference is in who is observing whom. In an opera house, the audience of many is observing a few. In these domed prisons, it’s the reverse. The domed prisons are stark buildings. On first inspection, I don’t believe that the viewer identifies the interior as a prison. The ceiling of Arnhem in The Netherlands reminds me of the tartan pattern now made famous by Burberry. The photograph is very graphic, quite unlike the opera houses. Opera houses and prison houses become a study in contrasts between beauty and squalor, opulence and poverty, serenity and cacophony. PP: How did you get access to the Dutch prisons? DL: I tried to reach out to the prisons and I tried to reach out to the Minister of Justice but no one would return my emails or telephone calls. There was the language barrier too. Nothing was happening. Then a man who ran a music company in Utrecht wanted to use one of my opera house images as wallpaper in his office. I gave him a quote and he wrote back saying he couldn’t afford it. I asked, “Would you like to barter?” I asked if he knew anyone who could get me into the prisons. He had a client who was a communications director for the Ministry of Justice. That’s how I got permission! All three of the prisons are no more than an hour from Amsterdam. No crazy travel involved and all under the same authority. Get into one, get into all three, right? PP: Are you able to compare Stateville with the Dutch prisons? DL: Prisoners in Stateville prison are treated like animals. The U.S. government is going to say they committed crimes, well people in the Netherlands committed crimes too. Who knows if they are the same level of crimes but in the Netherlands they have privacy. They have microwaves, TVs; they’re like tiny little apartments. I’m not saying they are the best place to be but it seemed a lot more civilized. Dutch roundhouse prisons had badminton courts, soccer courts, basketball courts. The Breda prison has trees and benches. Half of it is a covered with a glass floor and downstairs there’s a dining hall and ping-pong tables. When I was there [in one of the Dutch prisons] some smoke was coming out one of the cells, and the guard there knocked on the door and asked, ‘Are you okay? What’s going on?’ They didn’t know, but the prisoner said, ‘Something caught on fire in the microwave, there’s no problem.’ The guard went away. Once the [Dutch] cell doors close, the prisoners have privacy. At Stateville, with the standard open bars there is no privacy. PP: You never intended to photograph prisoners, though? DL: No, only the architecture. It was stipulated that I could not photograph faces anyway. After 6pm in the dutch prisons, men had to be in their cells. Then I was free to walk around and photograph. It’s seems funny for me to say they are beautiful spaces; they are prisons. DL: It is loud. The warden at Stateville gave me assurances. But he also told me not to show any fear. One prisoners was running against the bars the entire time I was there. Bang. Bang. Bang. Endlessly. It was shocking. Everything at Stateville was the complete opposite to what I experienced in the Netherlands. SF: What was the process like? How was it different to be in that space, with all eyes on you, vs. being alone in an empty opera house? DL: I have always had stage fright. Photographing from the center of a round prison causes anxiety. The inmates are all yelling, jeering, talking, in cacophony. You become the center of attention, and taking the photograph becomes a performance in itself. At first I was intimidated, but then I blanked everything out and focused on photographing. It must be the same for the performer. SF: What equipment are you using and what conscious choices are you making visually? DL: I work with a large-format camera so that I have the utmost control in making sure the composition of the image is architecturally symmetrical. I pay close attention to ensuring the lines are straight for perfect repetition, curves of the convolutions of ceiling and higher and lower catwalks are parallel and empasize Euclidean geometry. With this camera, I am also able to flatten out the space to make it look more like a painting. For instance, the industrial chandelier hangs down, but it looks askew, as if it is tilted toward you. SF: What is the importance of having 40×50, 50×60 and 72×90 inch prints? DL: Prints have to be large in order for all of the details to separate and be seen. When they are small, details meld together and you lose the ability to feel the texture/coldness of the prison bricks, to see the blur of prisoners behind cell doors. I want the viewer to experience what it feels like to be surrounded by the space. The Dutch are pragmatists as well as people of some moral imagination. Dutch prisons experience low rates of recidivism. They have libraries, jobs, education program’s etc. It’s not just about microwaves or dignity, but rehabilitation. In the end the cost to society is lower than the barbaric retributive approach of the US.